Bella Main is worried about attempts from a ruthless European banker, the mysterious Calouste Doubenkian, to take over the immensely rich and totally private bank that she heads. When Bella offers Tweed the job of Chief Administrator of the Main Chance Bank he declines, but the visit to the mysterious manor house Bank Headquarters deep in a dense fir forest in Southern Britain stays with Tweed and sidekick, Paula. When Bella Main is brutally murdered, Tweed's SIS team is immediately called in to track down the killer. As all chief executives of the Bank are members of the family, and live in the manor there is no shortage of suspects within the family, but there is also the mysterious Calouste, who is lurking nearby and he wants Tweed dead. The plot includes an awful lot of charging around England and lurking around in forests as well as; unlikely hiding places for the arch villain right in the bosom of the investigation; family tensions; elaborate and slightly bizarre ships, light planes, Audis and Rolls Royces and, of course, bullets flying. There's a chateau, a trip to Belgium, corrupt police, huge numbers of Calouste's loyal thugs and hidden passages and mysterious buttons in lifts. All of this adds up to something that, whilst it's totally unbelievable and utterly without social commentary or anything vaguely resembling thoughtful consideration of the murder and it's outcomes, is a romp, a silly fantasy. It's really not much of a stretch to see Diana Rigg in a tight black jump-suit and Patrick Macnee in a bowler hat. 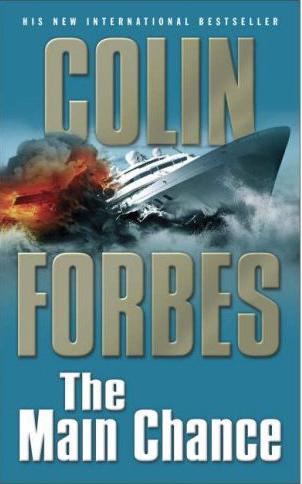 It's been a long time since I first read a few Colin Forbes books and there is certainly a lot that's similar to those in THE MAIN CHANCE, but who cares, once you realise that there's nothing in this that's supposed to be anything other than a bit of light amusement. It was fun with lots and lots of groan aloud moments!